Our previous home was in Littlemoor Road and when the Church was founded in 1847, the members and congregation were known as Littlemoor Baptist Church. The building was typical of those built during that era plus other Baptist congregations nearby. When they closed we became Pudsey Baptist Church and we were extremely sad to vacate the building in October 2005. Although the building is now luxury apartments, the builders did retain a number of the wonderful features and we did bring just a few items of significance with us as we began a period of waiting on God to reveal His plan for us. 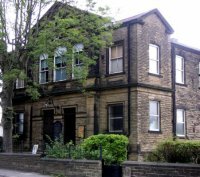 The Meeting Room, where we are Pudsey Baptist Church now, is multipurpose – and we have the added bonus of the use of our garden. In the warmer weather the chairs and table are set out for coffee mornings and other occasions.